The large numbers are gut-wrenching in a way that the cheerfully trivial prices of food and shirts and sarongs are not. Several sources put Bali's per-capita income somewhere around US$250/year, Tokyo's around $45,000, Boston's maybe closer to $42,000. Taman Burung's $12.50 is thus 5% of Bali's annual per-capita income, or the equivalent of $2,250 in Tokyo or $2,100 in Boston. For Taman Burung to be as affordable as Ueno, it would have to lower its tickets from $12.50 to less than a third of a cent. At which rate, obviously, it couldn't afford to exist. 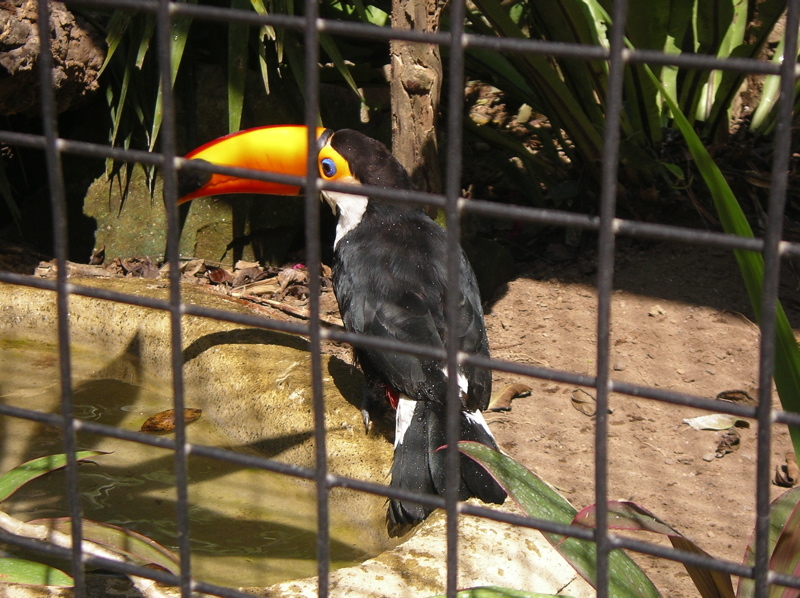 Not only have B and I flown from Boston via Tokyo to see this toucan in a zoo that people who can walk to its gate for free still can't afford to enter, but only a few months ago we saw this bird in its native banana trees in Costa Rica. To adjust for the income disparities you have to imagine those trips costing us, in our money, a number so high it would only sound rhetorical.